World TB Day is observed every year on March 24. Background : Why World TB Day is celebrated on this Date? 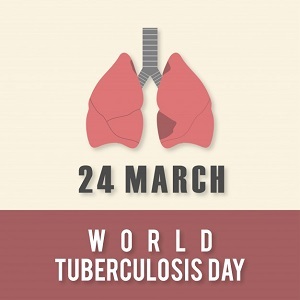 World TB Day commemorates the date in 1882 when Dr. Robert Koch announced his discovery of Mycobacterium tuberculosis, the bacteria that causes TB. This year’s World TB Day theme “Wanted: Leaders for a TB-Free World. We can make history. End TB” highlights the importance of engaging and empowering leaders in public health, government, medicine, and communities in efforts to eliminate TB. The theme: "Wanted: Leaders for a TB-free world"
The theme of World TB Day 2018 - “Wanted: Leaders for a TB-free world”- focuses on building commitment to end TB, not only at the political level with Heads of State and Ministers of Health, but at all levels from Mayors, Governors, parliamentarians and community leaders, to people affected with TB, civil society advocates, health workers, doctors or nurses, NGOs and other partners. All can be leaders of efforts to end TB in their own work or terrain. Who is most affected by this disease? This disease is deeply rooted in populations where human rights and dignity are limited. While anyone can contract TB, the disease thrives among people living in poverty, communities and groups that are marginalized, and other vulnerable populations. TB is preventable and curable, yet it remains the world’s leading infectious disease killer. TB affects millions around the world; in every state; in rural areas and cities; in schools, workplaces, homes; and in many other places where people are in close contact. Drug-resistance continues to threaten our ability to treat and control TB disease. Better diagnostics, shorter treatment regimens, and strong partnerships domestic and globally are needed to accelerate the path to elimination. Last year, WHO reported that 10.4 million people fell ill with TB and there were 1.8 million TB deaths in 2016, making it the top infectious killer worldwide. Worldwide India is the country with the highest burden of TB. There are an estimated 79,000 multi-drug resistant TB patients among the notified cases of pulmonary TB each year. In 2016 an estimated 28 lakh cases occurred and 4.5 lakh people died due to TB. "We need to tackle this problem as part of the larger challenge of increasing access to primary health care services. All people no matter who they are where they live should have access to TB diagnosis and treatment as part of a package of general health services that bring multiple health benefits."